A wall built out of brick, block, or stone which wraps around an area you want contained. This could mean containing dirt or soil for a garden, or larger projects like wrapping around your land to extend its reach. Retaining walls are often used to secure your land and protect your home, or for aesthetic reasons. 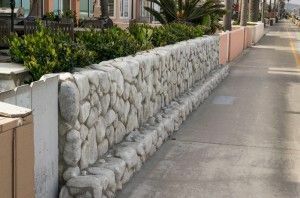 Why would you need to protect your home using a retaining wall? When the land surrounding your home slants toward it, a retaining wall is needed to ensure the earth doesn’t slide toward your home. This could be problematic during rain storms or earthquakes as the land could then slide toward your home causing a lot of damage. A retaining wall can act as a buffer. Another reason a retaining wall would be a good idea is if the land around your home slopes away from it. Instead of having it gradually slope off into the surrounding road, you could build a retaining wall around your property, and raise the level of your land. Having a clearer line like this defines your property. Aesthetically, a retaining wall can be a beautiful addition to your property for gardens, fountains, and tiers. By building a retaining wall you can add a lot of dimension and functionality. Whether you use it for a garden, or to add a secondary patio to your backyard, a retaining wall adds a lot of beauty to your home. CMR offers full-service retaining wall construction. We are happy to wrap around small areas, or entire properties. Depending on the length and height of your retaining wall, we will be happy to offer you a quote. Call us today at 877-346-5696!